This book is that rare volume whose insight, inspiration, and artistry make me give thanks I know how to read. Rufin’s creation follows the grand tradition of André Malraux or Albert Camus, as a novel of ideas, among other things; The Dream Maker is fine literature, maybe great literature. Jacques Coeur was a midfifteenth-century son of a furrier who became the richest man in France. In Rufin’s premise, his genius rests in the way he dreams of what doesn’t exist. From a childhood misadventure that nearly costs him his life, he conceives a startling, revolutionary idea: that power based on intelligent governance is superior to that of brute force. Later, as a merchant traveling to the Levant (which he has yearned to visit ever since a pelt salesman brought a live leopard to his father’s fur shop), he understands the transformative force of commerce. Not only is it more effective than war as a way of life or path to wealth, it changes people by providing what makes life worth living–new ideas, security, pleasures, comfort, beautiful surroundings, art. Of course, commerce also corrupts, through money, and Coeur learns a lot about that, sometimes the hard way. He plans carefully and waits years to meet his king, Charles VII, but when he does, France’s future takes a dramatic turn. Charles harnesses Coeur’s ideas (and wealth) to expel the English and end the Hundred Years War, while suppressing the squabbling war lords who kept the country divided. But having lived through how Charles abandoned Joan of Arc to her fate after she gave him his throne, Coeur knows that Charles will betray him, too, someday. It’s when and how that someday will arrive, and what happens in between, that forms the core of this novel. Before I found The Dream Maker, I’d thought to write a novel about Coeur myself. I’m glad I didn’t. Rufin aims higher than I’d have ever imagined and captures the man’s inner life, with which he sustains the tension that, for me, never flags. That’s not to say you don’t get the cat-and-mouse politics with Charles, the voyages overseas, a clandestine romance with the king’s mistress, or other exciting events. You do, in elegant, masterful prose, neatly rendered in smooth translation. But Rufin goes further. Throughout, Coeur explores what these events mean about how humans treat each other and what they portend for a world moving toward what we have called the Renaissance. And as I read Coeur’s take on fifteenth-century power and its uses, how men and women regard each other, what wealth signifies (or doesn’t), and the politics of betrayal, I saw how his story describes what’s happening now, all over the world. Given that, you won’t be surprised when I tell you that Rufin is a founder of Doctors Without Borders and has visited the killing grounds of Bosnia and the Sudan. He has also served as France’s ambassador to Senegal and in a ministerial capacity in Paris, so he’s well qualified to parse the themes he’s chosen in The Dream Maker. 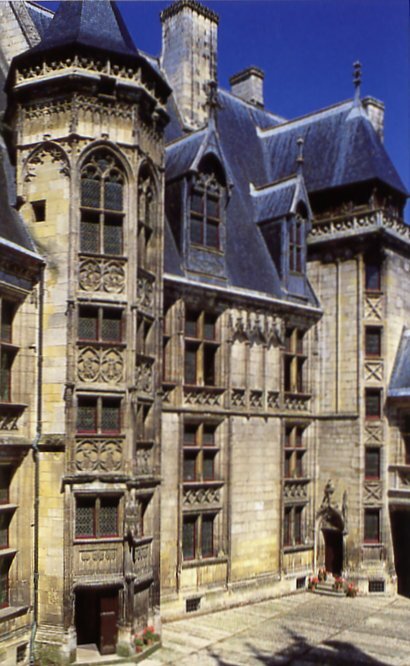 But perhaps most important, he grew up in Bourges, where Coeur came from, in the shadow of his palace that still stands. Rufin has Coeur remark that this house, however magnificent, is unremarkable for the stones that built it, for stones have no need of man. What matters are the dreams that lie behind it, and Coeur hopes others imitate him by closely following their own. “The only thing that belongs to us,” he says, “is that which does not exist, and which we have the power to bring into the world.” I humbly take that as a lesson. Disclaimer: I bought my reading copy of this book for the purposes of review.